Pathways Bioscience was founded in 2014 by a team of biological scientists and entrepreneurs led by Dr. Joe McCord, with the goal of improving healthspan and helping people overcome the health and wellness problems associated with aging. A core belief at Pathways Bioscience is that the best way to achieve this goal is to support the body’s own defense mechanisms that allow it to protect and heal itself. 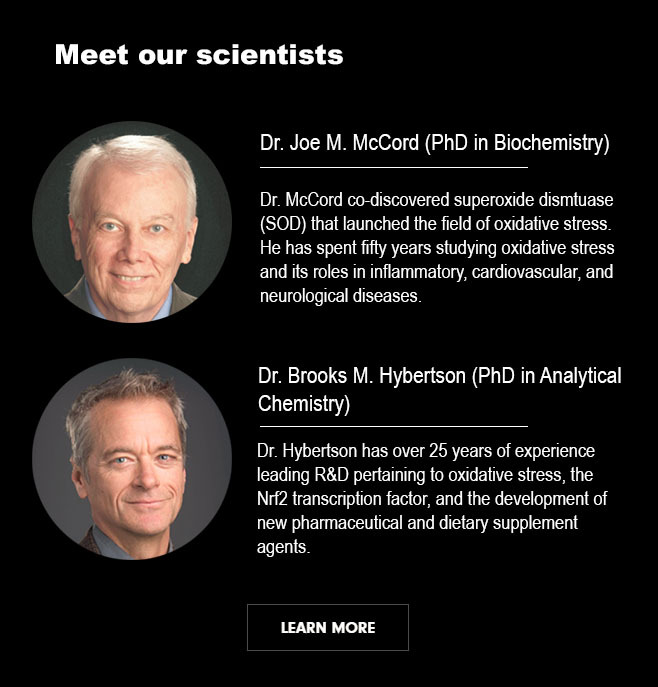 Building on several decades of innovative research, Pathways Bioscience scientists have developed a new Nrf2.0™ technology that led to the PB125™ dietary supplement, a breakthrough next generation Nrf2 activator. PB125 uses safe, natural ingredients with a long history of human consumption. PB125 not only activates but modulates the Nrf2 pathway which regulates a network of hundreds of genes inside cells and supports health and wellness. Pathways Bioscience is headquartered in Aurora, Colorado, at the Fitzsimons Bioscience Park adjacent to the University of Colorado Anschutz Medical Campus. Sign up with your email address to receive news and updates from Pathways Bioscience.